What have you done to my eyes! Oh, you've opened them up to a new world...of killing robots. 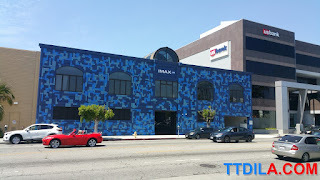 If you've been wondering what that trendy blue building near the Farmer's Market in Fairfax with IMAX on it is. It's not IMAX headquarters, no, if they were trying to act cool they'd move to the Arts District, just like Warner Bros Music. It'll cost millions of dollars to move, but man, is it going to be hip to be near all those homeless until full gentrification begins. Screw you, Warner Bros Music. 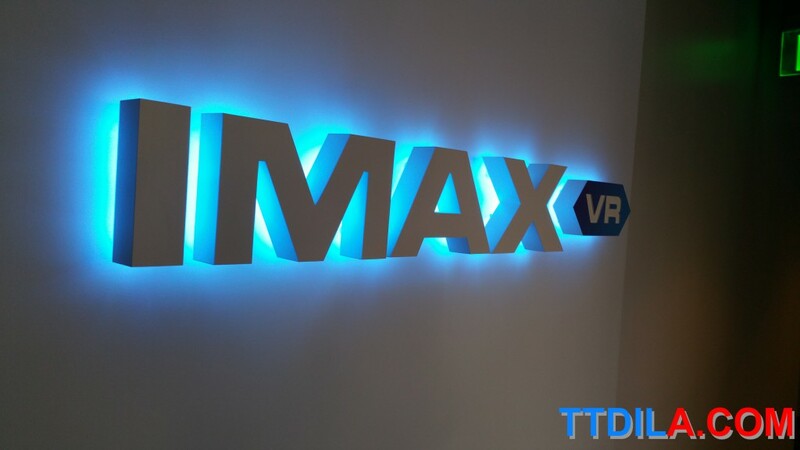 It's the IMAX VR Center, the next step in entertainment or at least what IMAX thinks it might be. That's what's next to The Grove. And within it are new worlds you can spend a few minutes in. You'll either park across at the Grove or Farmer's or spend $8 on IMAX's underground lot. 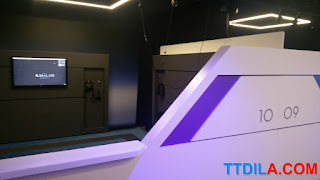 Then, if you haven't already picked your VR experience you'll choose it inside. The lobby is a little strange, it's not designed for a long time wait. You can stand around an awkwardly placed desk with the scheduled times near it. Behind it is empty country, for fancy standing and for signing forms for using the VR. We're not sure what could go wrong, but if sci-fi movies have taught us anything with VR, stuff can go wrong. And IMAX subscribes to this too. Can't remember signing a contract for seeing a movie though. You'll also see moving posters for the experiences that don't seemed to be time correctly. 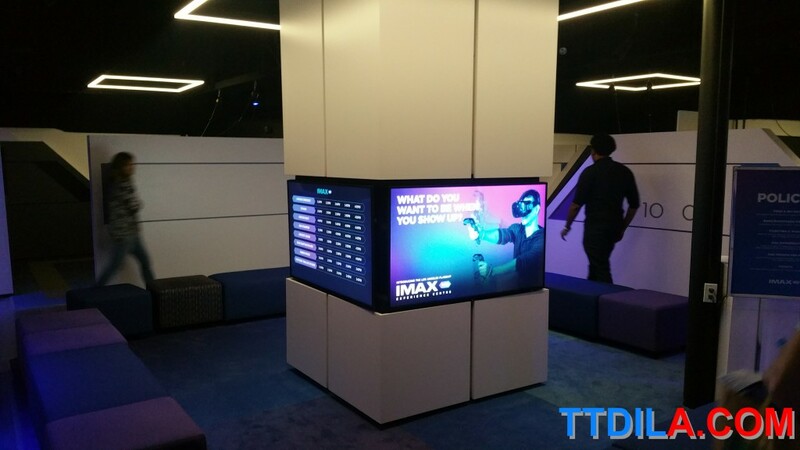 At the the scheduling desk you can pick your experience from about 7 different ones or the sampler. Sampling as much as you can in what we think is about 25 minutes. The staff will kindly tell you about each experience so you may deliberate among yourselves until someone else take your time. Then you'll go to the not very hidden wait area to sit on square cushions behind the tablets for the forms. We suggest being just a few minutes before your experience. Oh, man it's like a video gamer's dream in here. Broken into what they call "pods" are spaces you can experience VR in. We're not letting go of the name of pods, because those are definitely not in anyway pods. Pods means were lounging in some sort of future VR pea pod. It's just a nice sectioned off opened room are with sensors and enough space that you can move and not hit a wall. The lights are low, the center of the room has more seats for waiting for pods to open up. There you can see trailers for films with frame interpolation on, it makes these previews look so bad. You'd think at an IMAX run place they'd show off trailers without that weird affect on TV's that makes the movies look wrong. Now get in the VR suit! Not really a suit though. They'll politely ask you to put on VR goggles, hand you some type of controller and put headphones on you. 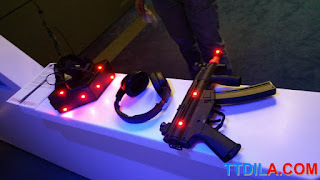 No, there isn't a hybrid goggle headphones helmet yet. That technology is still years away. We don't have helmet VR, yet. Staff will also have you put on a motion capture vest. Everything is cleaned after use, you can see the kits and staff cleaning devices before use. For belongings they have nice little net areas to keep you water-bottles or what have-you. We tried three experiences: John Wick Chronicles, Star Wars: Trails on Tatooine and Raw Data. Experiences are about 10 minutes for $10, per person. The run the gambit of silly to adults on the Xbox Live. Even though other people seemed to like it and it comes with it's on gun to hold while shooting, Chronicles can't. It can't get us excited. We got bored shooting bad guys off the top of a building? We're questioning that, like somethings wrong with us. We thought of a sketch of a guy getting a bored with an Uzi and yawning while playing. Star Wars is like they took a piece of the arcade unit you would find at theaters, Star Wars Anthology Arcade. There's no pod race, but you wield a lightsaber and deflect stormtrooper blasts. It make you crave more, even after helping fix the Millennium Falcon. Die robots! Die!!!!!! Raw Data, where have you been? We needed you back in the 90's in arcades. The dreams of virtual reality arcade games finally came true as we gunned downed wave after wave of unruly robots. As robots came up in our faces, and it's co-op...as a friend and myself became the living embodiment of every action movie we've seen we wanted to cry tears of joy. We killed waved after wave of robots, two-gunned and with endless ammo. That's with the ability to jump from position to position and special attacks and we could converse being miked. There were a few hilarious fixes that can be put in. That includes looking at your partner not contort into strange shapes that should not be humanly possible, also you shouldn't look exactly like your partner. There's other simple ideas the could be done that could expand the experience, but for what it is, which is an arcade shooter, it's a-Hell-of-a lot-of robot killing fun. Hey, the makers even made it that one friend can wield a sword while the others uses two guns. This is taken straight from child-hood arcades games. We could have been in there for at least twenty minutes for a full play, just yelling out one-liners and blasting bots as they attacked us in a 360 degree arena. Raw Data rocks! 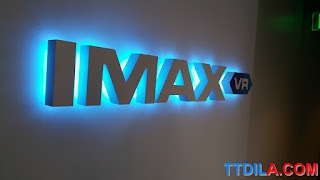 You have to give IMAX VR Centre some leeway as this is it's a flagship store and IMAX is the only real company trying to make it somewhere you can visit like a theater. We would call it a "learning experience" for them. 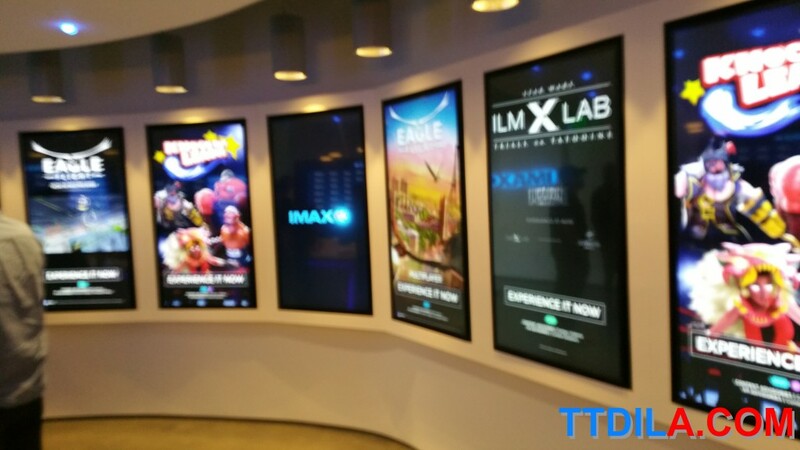 A problem did occur during one of our sessions and it took longer for us to start playing, IMAX comped us each a ticket for an extra session. 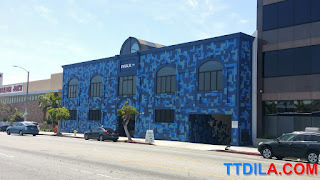 So they're trying and learning how to run a new kind of arcade/theater. Remember, your game is just running on a computer you can't see up in the ceiling. 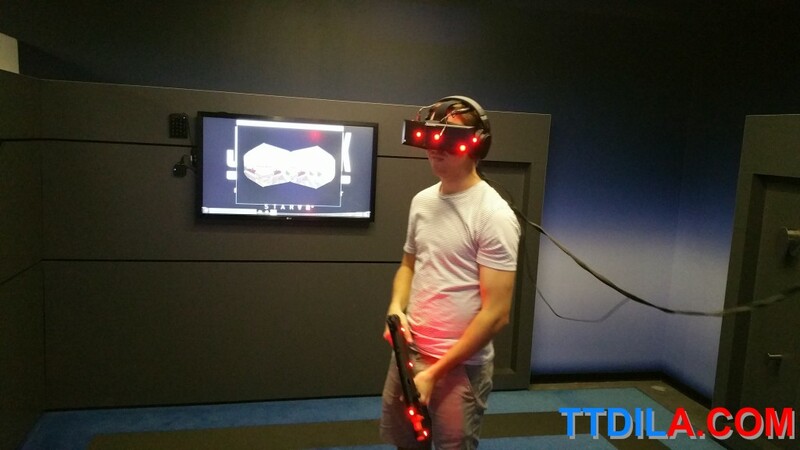 A smart move for equipment as it can't clutter the VR main floor. The only problem we did have was with the wires coming out of the back of the VR equipment, it can get tangled. Remember, you can't see what's going on outside of your goggles and IMAX might have figure out a better way of holding up wires. This became a nuisance a few times during gameplay. So it doesn't happen to you, because it happened to us and to others we saw waiting in line, we'll tell you, not every VR experience is multiplayer or co-op. A number of them are, but not all of them. And that means times can be different for you and "wink" a friend or I'm not winking on purpose this is a disorder that I don't want to talk about. So be mindful, you might be off from the same times you and a friend choose, even if you're choosing the same experience at the same time or five minutes apart. If not into killing robots, pffff, they have a number of more easy-going games like a flight simulator as a bird. 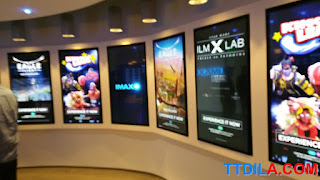 So IMAX is open for different games to come in like new movies coming to a theater. If you want to kill robots, I know a place.